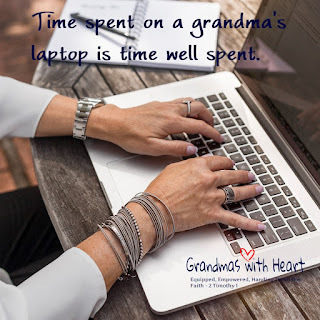 grandma's cookie jar: Time Spent on a Grandma's Laptop is Time Well Spent! Time Spent on a Grandma's Laptop is Time Well Spent! If you live near your grandchildren make time to spend some "laptime" with them in the coming week - put your arms around them and tell them how much you love them! Tell them how thankful you are God gave them to you and how you know He knew what He was doing when He created them! "Laptime" like this has value which lasts a lifetime. 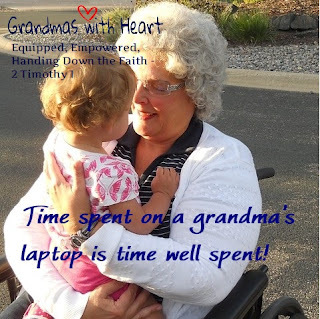 A grandma and a laptop are able to make a significant and lasting impact in the lives of her grandchildren! Take time each week to email, stay in touch, encourage, brighten their day and remind them how much you love them. You are also able to share Bible verses and about how God is working in your life by emailing your grandchildren. If you have not used email yet, make it a point to do so this week!